Ready to Try Some Winter Sowing? March is a great time to experiment with winter sowing – a low effort germination method that allows you to start a lot of seedlings for just pennies. The concept is simple – sow seeds of hardy annuals or perennials into homemade mini-greenhouses and then just place them outside to wait for spring. Your seeds won’t mind the winter temps; in fact, they require freeze & thaw cycles in order to germinate. No need to buy expensive germination set-ups or rig up grow lights. Mother Nature will take care of the lighting. All you need is a few recycled household containers and a knife or scissors. The easiest container to use is an aluminum carryout container with the clear plastic lid. Also effective are milk jugs or large plastic soda bottles. In a pinch, you can use cardboard milk or juice containers and a plastic bag. That long slog through mud season will be a little more fun when you can look forward to your tiny seedlings sprouting to announce the arrival of gardening season. Select the right seeds. Hardy annuals that can handle frost and may even need cold stratification to germinate are Bachelor Buttons, Poppies, Violas, Snapdragons, Calendula, Petunias, Sweet Alyssum, Amaranthus, and Cleome. Half-hardy annuals can tolerate some chilly weather but may be damaged by frost. Marigolds, Love-in-a-Mist, Four O’Clocks, Cosmos, Petunias, and annual Salvias can be started in early spring. Perennials include Foxglove, Gaillardia, Rudbeckia, Sunflowers, Snapdragon, and Echinacea. Any flower that has self-seeded over the winter in your garden is a good candidate. Find a good location for your containers. They’re meant to go outside in the cold, the rain, and the snow. Protect them from strong winds and bright afternoon sun. A somewhat sheltered location that gets morning light is ideal. Placing your containers in cardboard boxes or old propagation trays with drainage holes keeps them upright and allows snow and rainwater to drains out slowly. Now just sit tight and wait. As the weather warms, the flats will freeze and thaw repeatedly as spring approaches. Just when winter is about to break and you’re still getting nightly freezes, the first of your flats will begin to germinate. The seeds know when it is safe to come up, so don’t worry about the frosts. On an above-freezing days open them up and, if they look like they need a drink, give them one and then close them up again. As your seedlings grow, gradually open their containers to more light and air. Eventually you’ll have more open area than covered, and your seedlings will be hardened off and ready for transplanting. Compiled from Dave’sGarden.com & WinterSown.org. We are sad to see summer go—and such a lovely summer it was this year! But now is the time to enjoy the turn of the seasons and to harvest the garden’s autumn gifts. 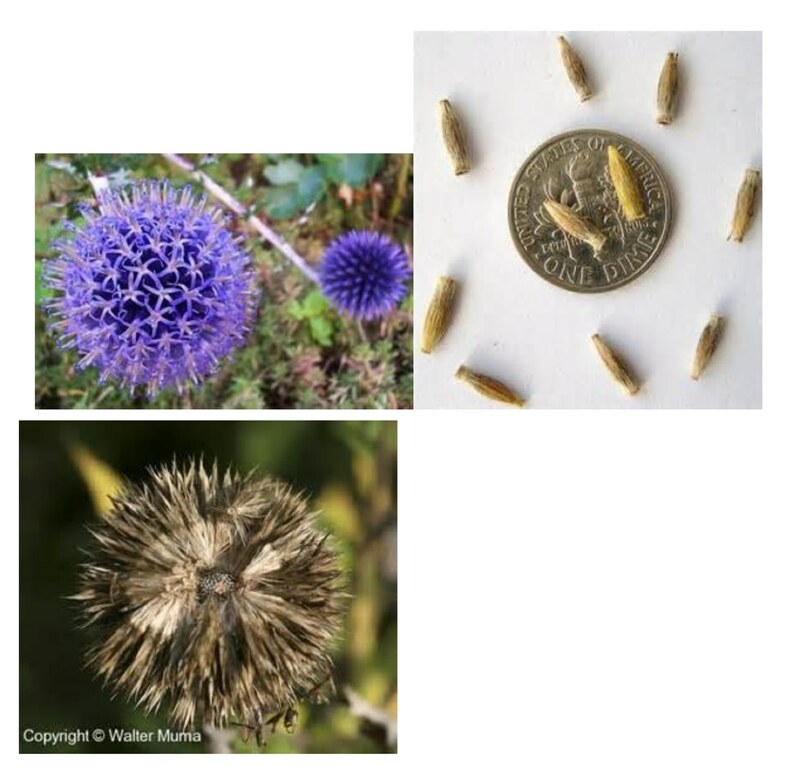 It is the perfect time to survey the landscape in search of SEEDS! You may find that some of the pods are still green and tightly closed. These should wait. But as they ripen, you can place a small bag or envelope over the stalk to keep seeds from exploding out from an open pod. When stems begin to dry, you can clip them from the plant and wait. 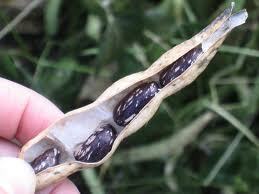 The pod will burst open and the seeds will fall into the envelope. You can snip an entire seed head into a bag, give it a good shake, and find the seeds in the bag, separated from the chaff. I love harvesting morning glory seeds. The brown pods along the stems are easy to find, and a clipper and paper bag make quick work of it. d botanical); sun/shade; size of mature plant; color; sowing time (before or after frost, indoors before last frost, etc.). 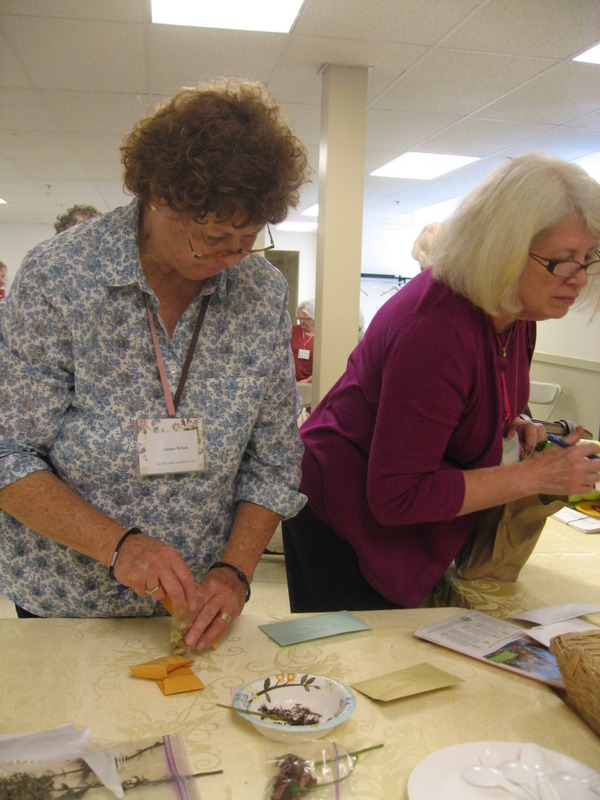 The cards will be placed with the seeds, and people could write info on their seed envelopes. Labelling is very important. You do not want to draw a blank when you get home with those lovely, mysterious packets of genetic material. As always, please let me know if you have a question. If you have been eyeing that gorgeous plant in the neighbor’s yard, ask her for seeds. This meeting will be lots of fun, with seeds and information shared all around. If you had luck with last year’s seeds, share your success with us. 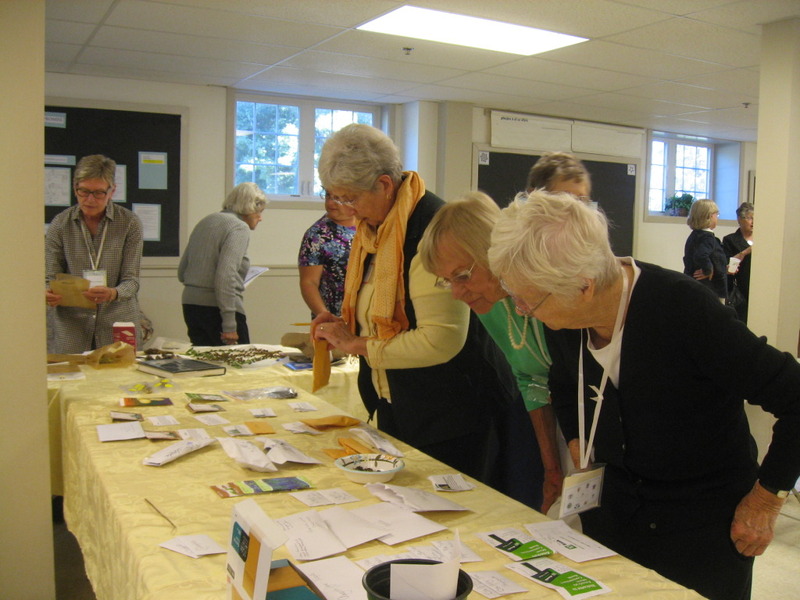 Hope you all enjoyed the seed swap. It will be fun to see if you have any luck with them next spring. The webmaster is ashamed to admit that she hates seeds. You see, she’s never been able to induce seeds to grow for her. Oh well, thank goodness there are those among you that are able to grow them. You know who you are…. Here are some snaps of the event that Terry took. Wild mustard – no, not Phlox—“Dame’s Rocket” has four petals. Phlox, five. 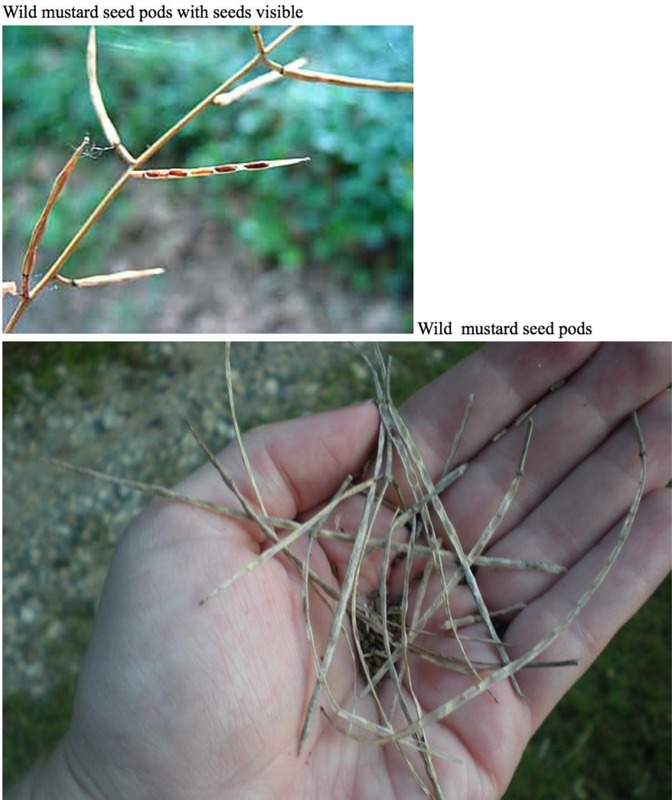 Note the difference in the seed pods pictured below. 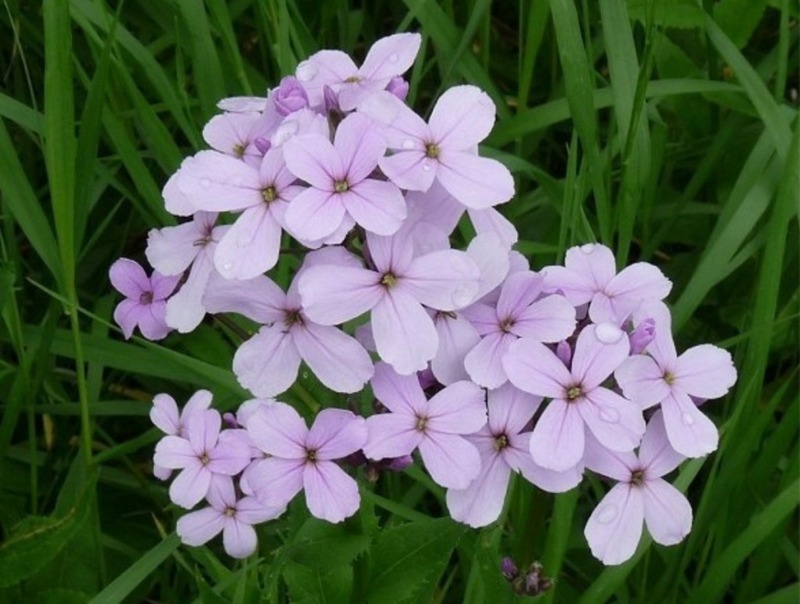 This wildflower looks like Phlox but it’s easy to tell them apart. Start pulling Dame’s Rocket flower petals with ‘She Loves Me’ and you’ll find ‘She Loves Me Not’ when you get to the last one. Your garden phlox will always love you because it’s odd. 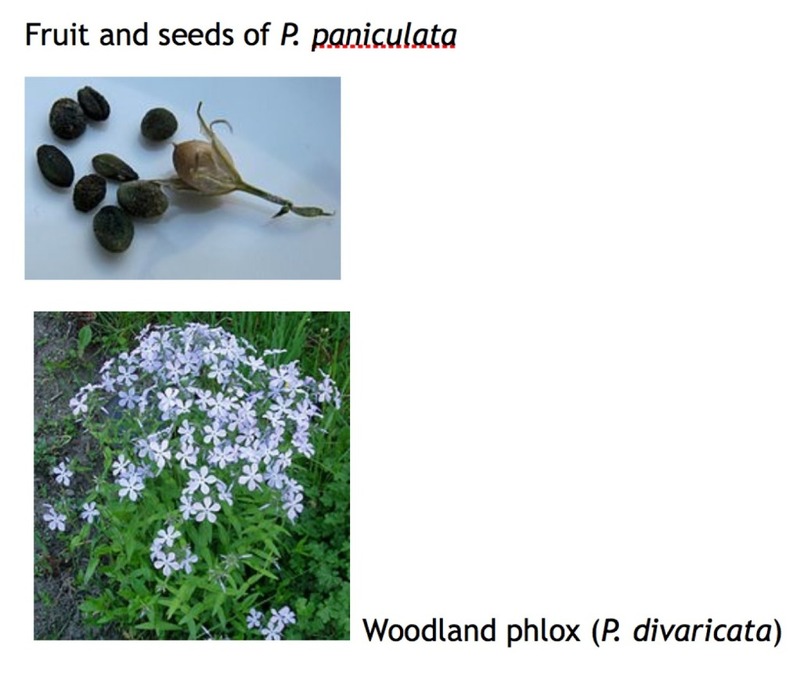 Dame’s Rocket has 4 flower petals compared to the 5 of Phlox. It is a member of the Brassicaceae family. 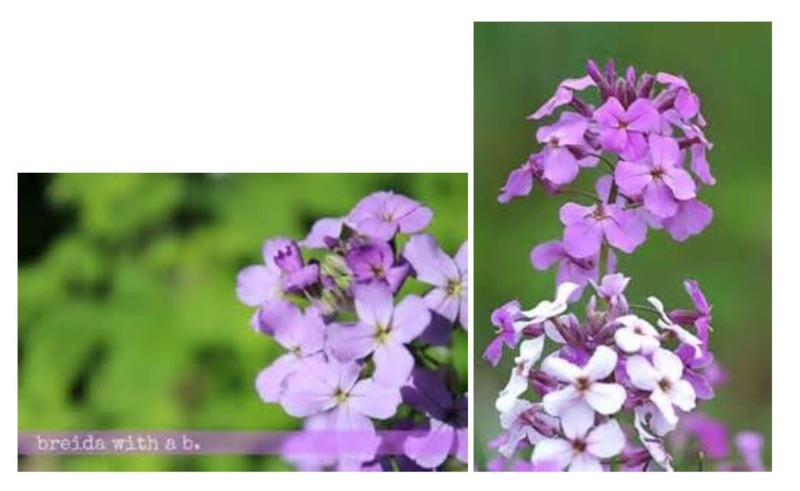 Dame’s Rocket is an invasive alien wildflower that has escaped from garden settings it is native to Europe and was brought over to the new world to be used as an ornamental plant. Their aggressive nature is actually a family trait. When it goes to seed Dane’s Rocket gives away it’s family identity. The long seed pods mark it as a member of the mustard family. Can’t wait to see what treasures YOU will discover. Have fun. See you on the 18th. 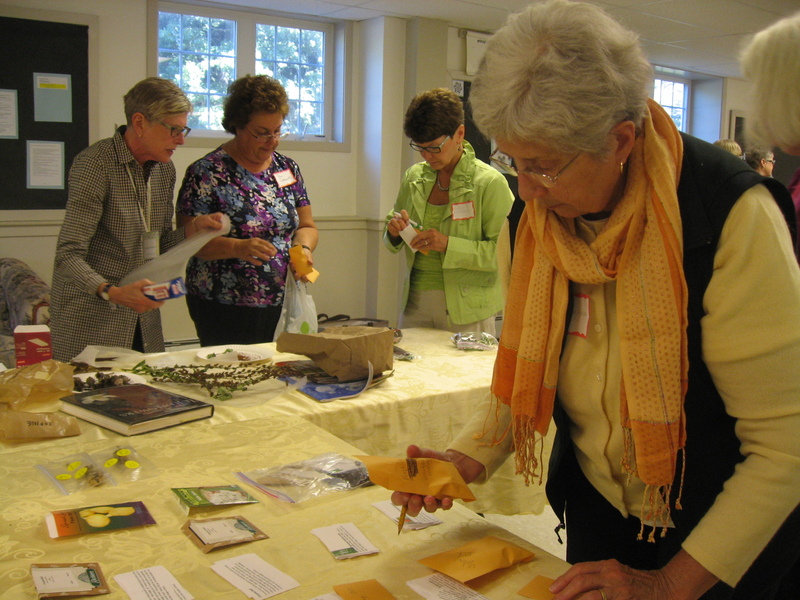 The September meeting will include a seed and bulb swap. Don’t forget to bring your harvest. 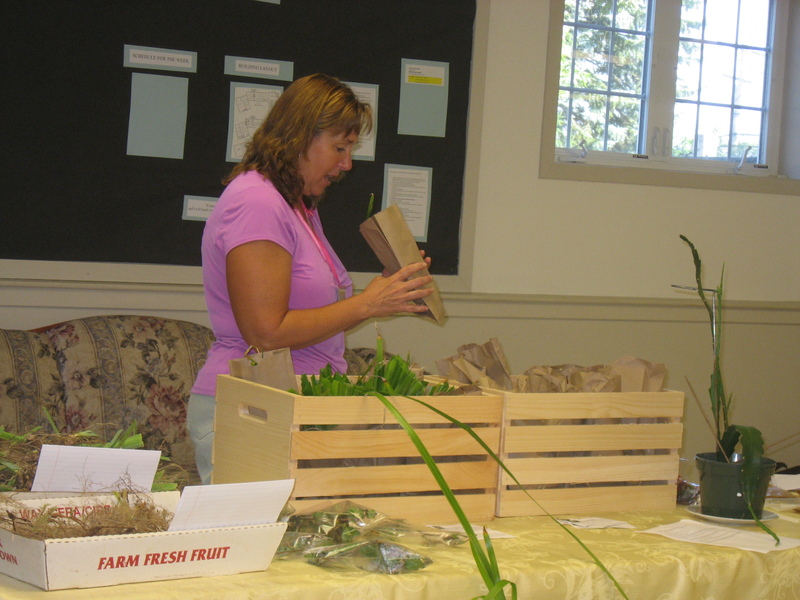 Also welcome are bulbs and unused commercial seed packets. This is a great and inexpensive way to try something new in your garden. Please bring your loose seeds and bulbs in a marked container so that swappers will know what they are getting! Read the following articles on how to use and prepare your future plants! Terri is passing on some tips on germinating from Will Kimerer. They will be discussed at the meeting. “If the seeds were collected from plants that grow outdoors here all year, chances are the seeds need to be cold stratified for 1 to 3 months (depending on the species). This softens the hard seed coat, allowing the seeds to germinate. 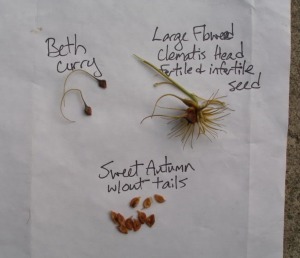 Some seeds may germinate without stratifying, especially if they are barely hardy here. The length the seeds can be kept also varies–a lot. Usually hard coated seeds last longer than soft. Also, smaller seeds tend to last longer. After harvest, they can be cleaned, usually by soaking in warm water overnight, then scraping the fruit away from the seed/seeds. Then dry them for a few days on a paper towel before storing, stratifying or planting. To cold stratify, you want to put the seeds in slightly moistened medium (vermiculite, perlite, sand, or even just a moist paper towel), and seal it in a plastic bag so it doesn’t dry out. Put them in the refrigerator (usually crisper drawer). After the few months, you can plant in whatever medium you wish (sterile is best). If you plant directly outside, you can skip the cold stratification if you plant in the fall before winter (they will be naturally cold stratified); but some seeds may not like our really cold winters. **Note all the plants noted here require at least 6 hours of sun to thrive. Named for the Greek Goddess of the rainbow, Iris come in a rainbow of colors. 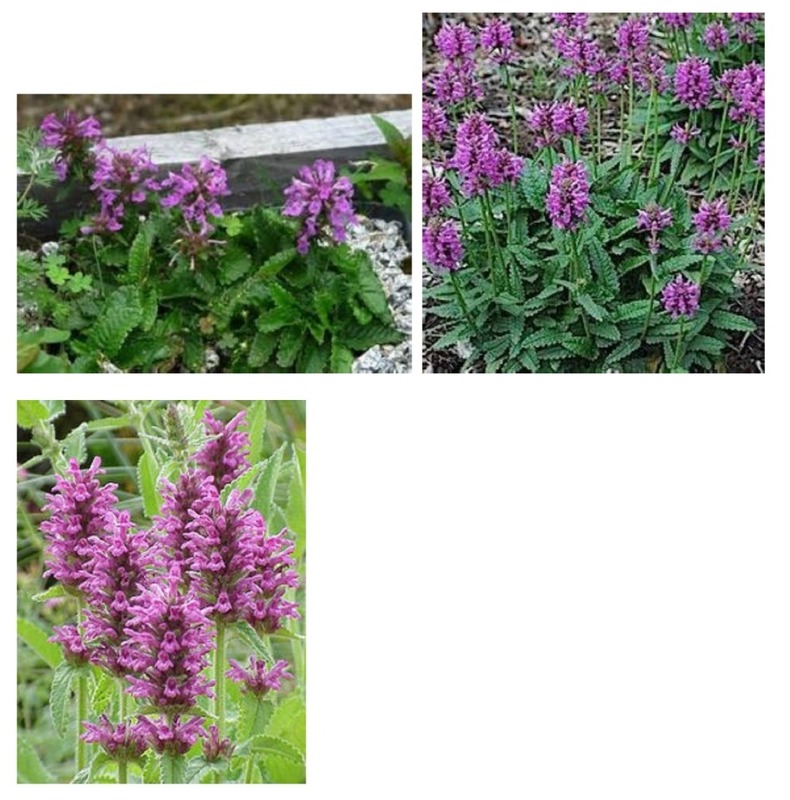 They are generally hardy to zone 3 and easy to grow in a sunny spot (6+ hours) in well-drained soil. Late summer is a wonderful time to divide iris, when they are easy to see and to split. Whenever dividing bulbs or rhizomes, make sure the gardening knife, spade or other tools you use have been cleaned with alcohol or bleach to prevent transferring disease. Begin by digging up the rhizomes that you see growing along the ground. Dig up the clump by inserting the trowel or shovel into the soil around the perimeter to loosen the roots. Use caution when digging not to damage the rhizomes. Pull up the clump you want, using a knife if necessary to divide it (but often you will be able to just pull it apart with your hands. Wash the clump and look for rot or worms, and discard any portions that are diseased or infested. Clip the fan of leaves at the top of the plant to 4-6”. This will help your plant spend more time on root development when you transplant it. Each rhizome should have at least one fan of leaves at the top and root growing out the bottom. Replant divided iris rhizomes 6-8” apart so that the top is visible at the soil surface and provide good air circulation. Do NOT mulch as this can promote rotting. Enjoy the new blossoms that should arrive next spring! 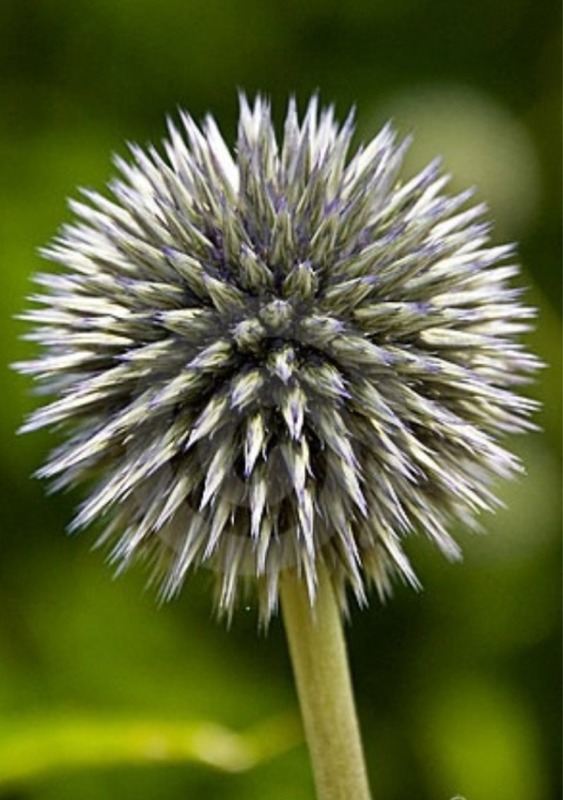 After blooms have passed you can prune the flower stalks and enjoy the unique spikey foliage through the summer. Iris will die back into the ground in the winter and dead growth should be cleared in the spring to make room for new growth. Tulips can tend to fade out after a few years, and flower less prolifically after a few years. 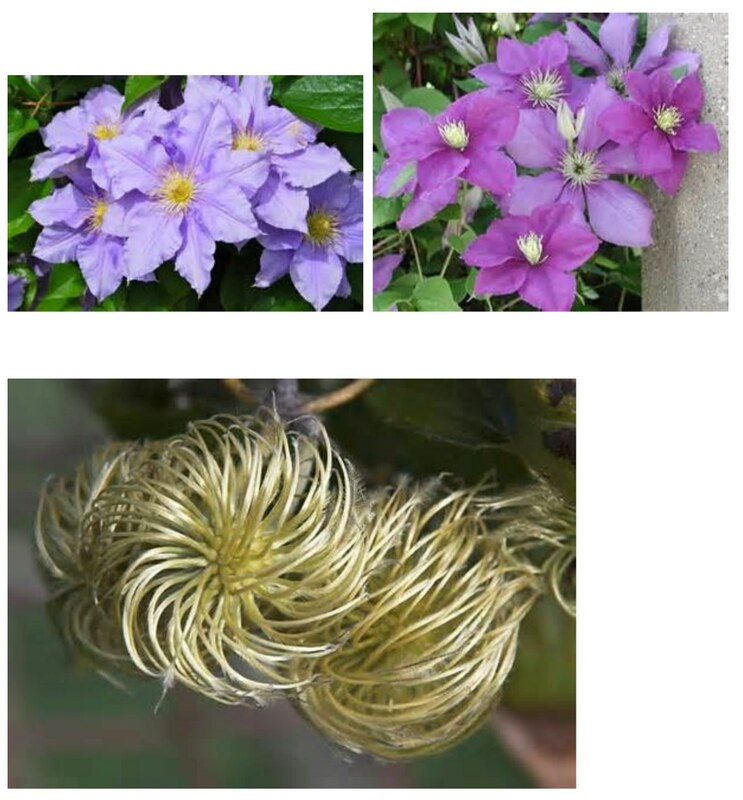 If you are seeing this occur with your blooms, what is probably happening is that the bulbs have become overcrowded and that is a signal it is time to divide. Dividing Tulips is trickier in the fall since most of the foliage has died back into the ground, but if you know where they come up each year, it will be easier. Start digging DEEPLY a few inches away from where you have seen the plants growing and lift under the bulbs to loosen them. Once out of the ground, rinse them and check for firmness and discard any that may be rotted. Damaged bulbs should not be replanted. You can either transplant them immediately or put them in a “holding” bed or pot to let them mature more if the bulbs are small. Adding peat moss to the hole where you plant your tulips with ensure the tulips good drainage. Special bulb fertilizer will help your tulips develop stronger roots as well. Plant tulip bulbs with the pointed tip up. Daylilies are another perennial that now comes in a host of colors and flower styles. These hearty plants are easy to divide and share. Start with inserting your shovel or garden fork deep into the soil around the perimeter to loosen roots and isolate the clump. You can easily divide the clump in the middle or in sections by splitting it with your shovel. Watering a few days before digging will make the soil softer and make digging easier. Once the roots have been loosened, push your shovel or fork under the root ball to be removed, and lift, trying to keep the clump intact. Once you dig the daylily out of the ground, wash the excess soil off the root ball. This will mae it easier to pull the clump apart. Pull or cut apart the individual crowns. Trim back the leaves to about 6”. 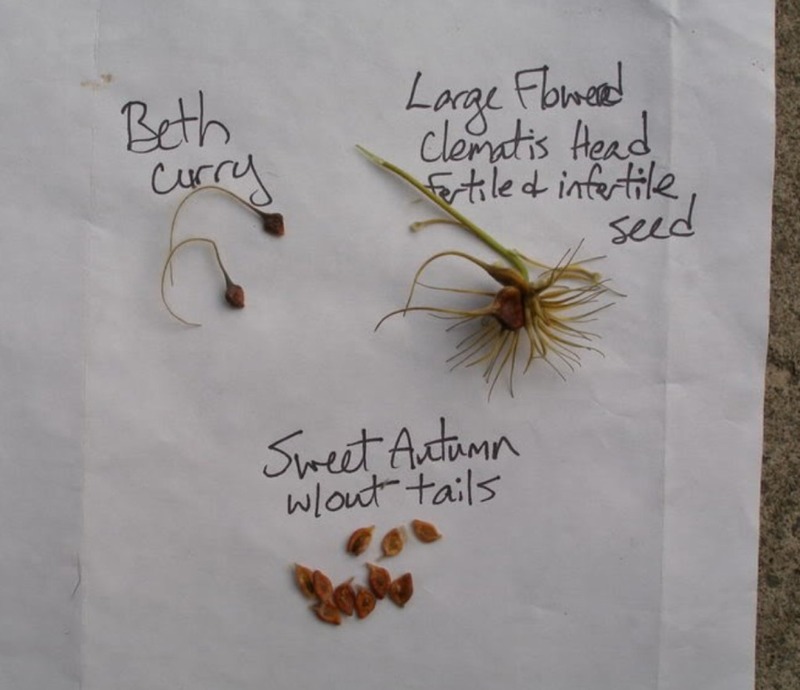 As with Iris, each clump needs to have a set of leave and roots in order to grow. Plant the divisions at the same depth as before and cover with soil. When replanting daylily divisions, covering with mulch will help conserve moisture while your new plants become established. Ok, so garlic isn’t a perennial, but in my book, and if you remember from Roger Swain’s program where he totally agreed, it is an easy fall-planted bulb. Garlic can be grown in your perennial or vegetable garden and offers a wonderful addition to your culinary efforts, has wonderful health benefits and can be dried to last a long time. You are lucky if you can find a friend who can share some garlic bulbs with you since each bulb can have 4-12 cloves which, when planted in the fall, will produce a full bulb to harvest in summer. Garlic likes fertile well-drained soils. There are two types of garlic that will grow in Zone 5: Hardneck and Softneck. Hardneck is just what it is called, a bulb that ends up with a hard stalk in the middle when dried. The additional benefit to growing Hardneck garlic is that it produces curled garlic scapes in June. The scapes have a milder garlic flavor and can be used for pesto, stir fry and more. Softneck varieties do not produce scapes, but are great for braiding since they do not have the hard middle stalk when dried. How to plant garlic: choose a sunny site, mix in a 1” layer of compost into the soil. In acidic soil, mix in a light dusting of wood ashes. Break apart bulbs into cloves and plant 4 inches deep and 6 inches apart, with pointed ends up. Cover the planted areas with a good layer of mulch such as hay or shredded leaves. How to harvest garlic: Scapes generally appear in mid to late June. Each plant produces one curly scape that can be cut as soon as it curls. Cutting them too late will mean tougher scapes. In late July when you see tops dry, use a garden fork to loosen the soil before pulling the plants. Place the fork to the side of the bulbs and push deep to lift underneath. Pull out gently. Lay whole plants in a dry airy spot (in the garage on some newspaper is fine) and leave to dry for a week or more. Brush off dirt, prune off roots at the bottom. Washing can introduce bacteria so is not advised. On hardnecks, trim off stems, in softnecks, either trim or braid. Store in a cool place; length of storage depends on the bulb variety.